Congratulations to the winners of the Lucky Star random drawing. They win $100 for their A-Team to use for the remaining appreciation days. They are: Hillcrest Elementary in Hamblen County; Fayetteville Middle School in Fayetteville City Schools; and Camden High School in Benton County. 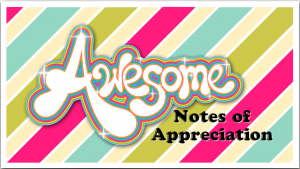 The winners of the random Awesome Notes of Appreciation are Camden Elementary School in Benton County for a notewritten to Mrs. Sherry by Max Wright and Anderson County Career & Tech in Anderson County for a note written to Mr. Myers and Mr. Herrell by Destiny Hopper.